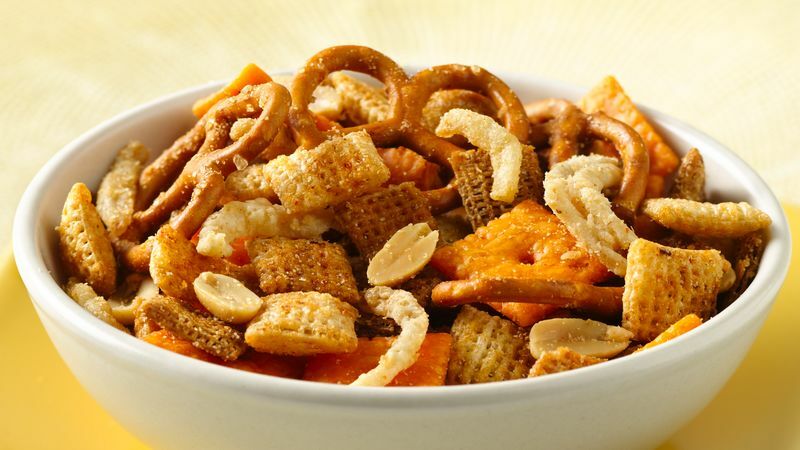 In large microwavable bowl, mix cereals, crackers and pretzels. In 2-cup microwavable measuring cup, microwave butter on high about 40 seconds or until melted. Stir in steak sauce, Worcestershire sauce and pepper. Pour over cereal mixture; stir until evenly coated. Microwave uncovered on High 4 minutes, stirring after 2 minutes. Stir in onions and peanuts. Sprinkle with onion and garlic powders; toss until evenly coated. Spread on waxed paper or foil to cool. Store in airtight container. Try mixed nuts in place of the peanuts.